Planning is the very first thing that we need to do in order to carry out something. Things may still be carried out without a plan, but it will be difficult to implement, disorganized, lacking, and often the goal is not reached. It will just come out as an utter waste of time, money and other resources. There are also risks associated with lack of planning. These risks could either be on an individual’s health or their safety. A health and safety plan is created and used regardless if the nature of an industry is prone to danger or not. Accidents and other emergencies happen when they should happen and the planning for that helps zero out the casualties or put it to a minimum. 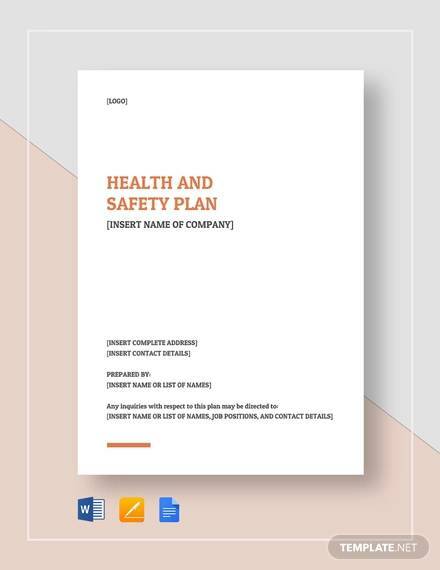 Let us further take a closer look at health and safety plans together with some useful plan templates as reference. 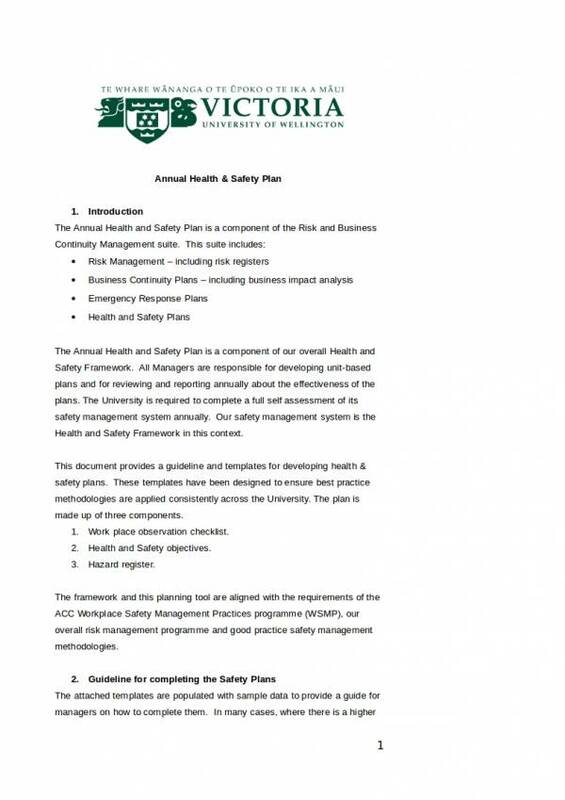 What Is a Health and Safety Plan? A health and safety plan is specifically created to ensure that employees or workers are healthy and fit despite of the health risks that is brought about by their demanding jobs, and ensure that they are kept safe by providing a conducive and safe working environment. Health and safety plans should not be taken lightly even if accidents and other dangerous situations don’t always happen all the time. It aims to ensure the safety of the people, hence it should be created in a way that will help prevent any dangerous situations from taking place. You may also check out other useful related topics, like Safety Plan Samples & Templates and Sample Health Lesson Plans. Health and safety plans offer a number of uses. To be able to know more about what these uses are, we have gathered the needed information and made a list of them below. Serve and protect – The presence of a health and safety plan in a company or business is to serve and protect all of its affected employees against all matters relating to their well-being, health and safety. Describes hazards – Safety and health hazards are described in order for everyone to know what they are, what the triggers are and when they could possibly happen. Knowing what you are up to is a good way to protect oneself from any types of dangerous occurrences. Ways to overcome – Included in a health and safety plan is a way on how affected employees will be able to overcome the hazards and dangers that they may be encountering. It could be through health teaching, proper training, proper dissemination of information, and notifying employees of current health and safety news. Set goals and priorities – Part of creating a plan is to set health and safety goals that is beneficial to all those who are involved to ensure that they keep themselves healthy and safe at all times. Planning also helps them determine which things to prioritize or what things to do first to prevent any untoward health and safety hazards. Monitor health – Requiring an annual physical exam for every active employee of one’s company or organization is one way to monitor the health status of their employees. Also, hiring a company nurse and providing insurance coverage to every member of the company is another way to show that employers are willing and committed to keeping their employees in tip top shape. Provision of safety responsibilities – In order for the plan to be properly implemented and carried out, the health and safety plan mentions or indicates the group or the individuals who are responsible for providing safety. Serve as reference – It is not impossible to forget the details of a plan that is why a written health and safety plan is used as a reference to help employers and employees to remember about what the plan is all about. With all those uses, who wouldn’t want to make a health and safety plan for their company or organization. And because health and safety is always a priority, it is best to be plan and prepare for it regardless of the situation. learn about other types of plans and other related topics on our website. Some of the articles you may find interesting are Meal Plans Samples & Templates and Diet Plan Templates. What Are the Elements of a Health and Safety Plan? 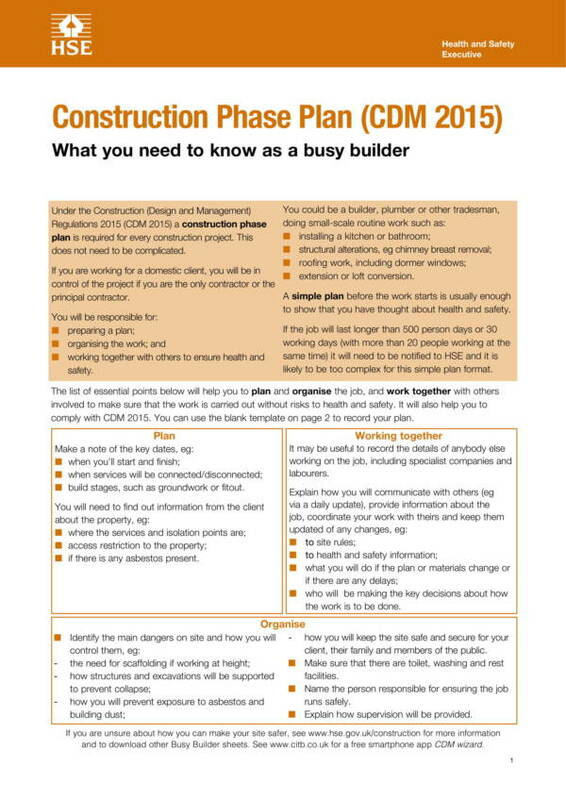 When making a health and safety plan, it is important that you know what information to include in it in order to come up with a useful and reliable plan. 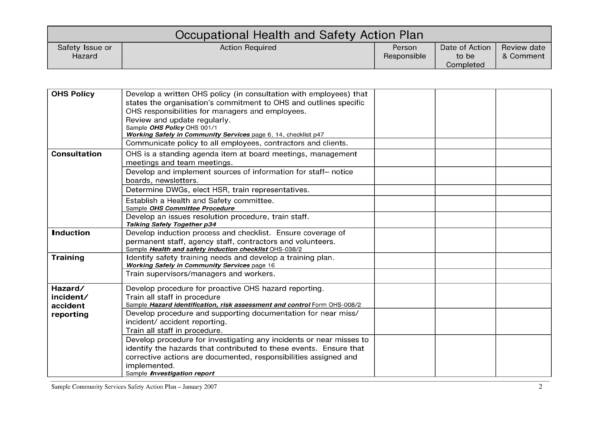 Statement of goals and policies – A health and safety plan should be goal oriented so it is important that it includes a list of goals and objectives that must be met or achieved by the company or organization that created it. Also, policies should be in place and should be part of the plan. List of responsible persons – The list includes their names, designation and department in the company organization, a short description about them and why they are assigned the task, how they can be contacted and their contact details. Identification of hazards – A description of the possible hazards should also be included in a health and safety plan. They can be categorized or based on the dangers that could actually take place within the organization while at work or those that can take place outside of work. Hazard control – Details on how to control the specified hazard should be provided. It should be the efforts that the management is taking to keep everyone safe and healthy. They could be little but useful things, like always keeping the office and comfort room floors dry, organizing a daily exercise habit after work, joining fun runs, organizing sports competitions and many more. Safe practices – Safe practices should be discussed and explained to everyone. This is one of the most effective ways to successfully keep employees healthy and safe. Health teachings and discussions at least once a week and monitoring if they are following it would be good. Responding to emergencies and accidents – Employees should also be taught on how to respond to specific emergency situations or accidents. They don’t have to learn the difficult things. Teaching them about first aid before actual helps arrives is the best thing they can be equipped with. Training and communication – Aside from teaching and lecture, actual training is needed so that employees will be confident to do what they are taught in time of need. Clear communications is also a must and should not be overlooked. All of the listed elements are equally important and should be included in every health and safety plan. Other related articles that you may find interesting are Business Operational Plan Samples & Templates and Sample Work Plans. 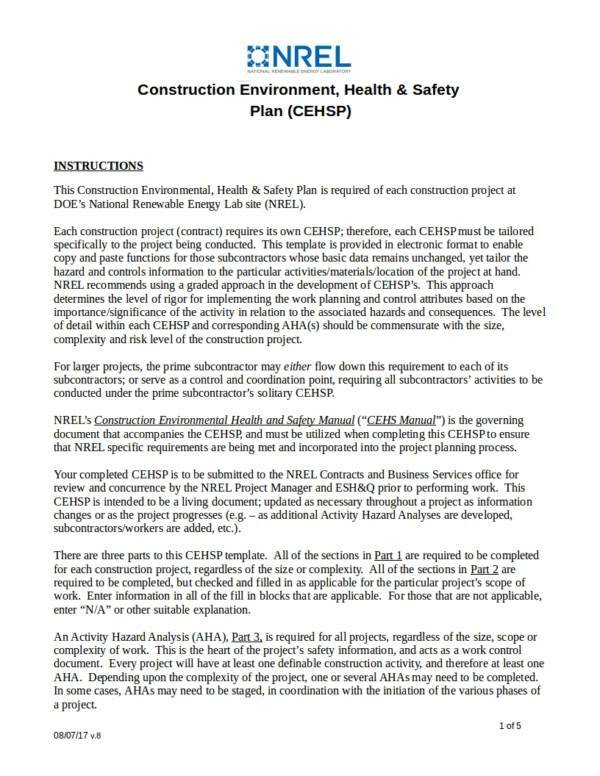 What is it about health and safety plans that make a lot of people want to use. This plan has its own template and templates are definitely useful. 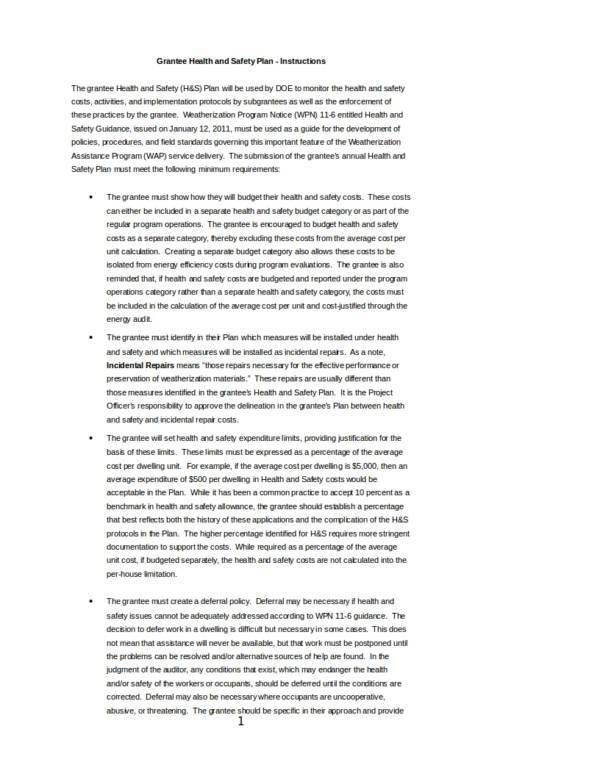 If you still don’t know yet, here are some of the advantages of health and safety plan template. 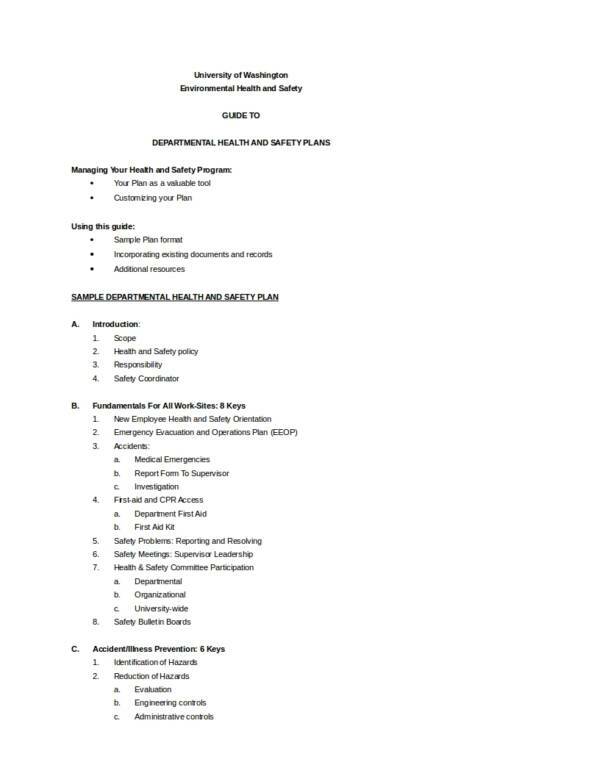 Health and safety plan templates allows its users to easily and conveniently create health and safety plan that detailed and complete with all the necessary elements. The template also helps save you more than half the time that you need to spend to create the entire plan from scratch. Since the template has all of the details that you need, you can guarantee that it will be complete and reliable. The plan will clearly communicate to everyone what they must know and what they must do. 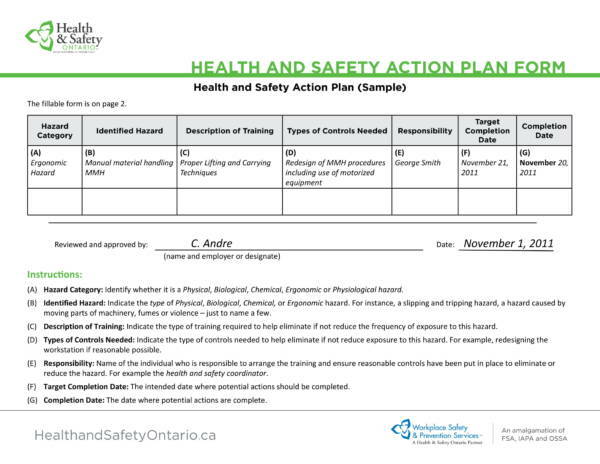 It is pretty easy to find a health and safety plan template online and on top of that they are available for free! You may also check out the samples and templates attached to this article. Can’t find the exact template that you need? Then edit or make changes to the closest possible template that you can get your hands on. These templates are made available in editable and easy to use file formats so that you won’t have a hard time dealing with it. 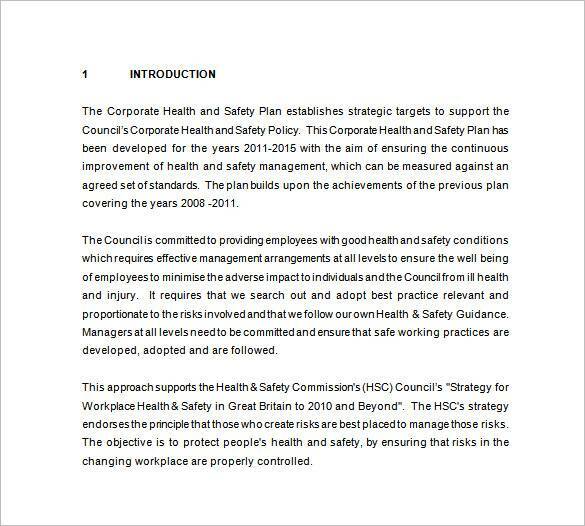 The health and safety plan templates that you can find online are also printable so you can create as many copies as you need to distribute to your employees or you may email them. 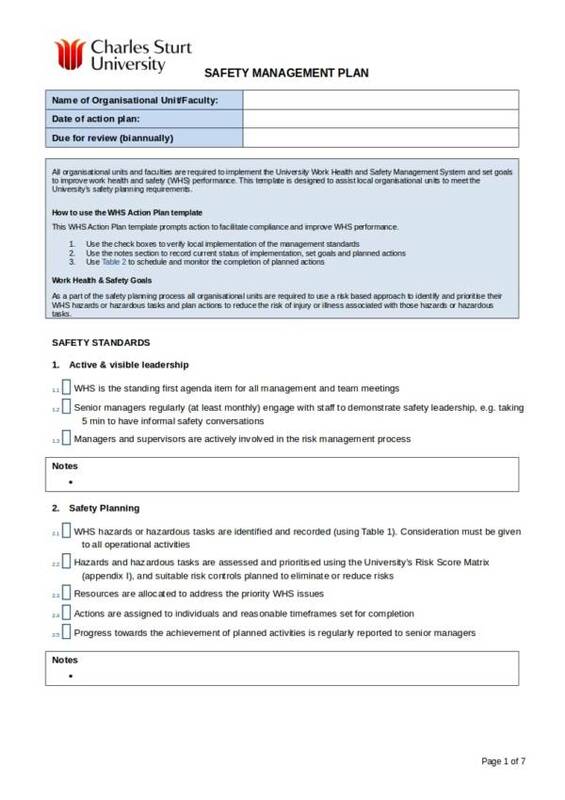 You are sure to create a reliable health and safety plan using a health and safety plan template. That’s a lot of advantages! Don’t you just find it amazing how a template can help and do a lot of things? Well, you should consider using a health and safety template or other templates for your needs. 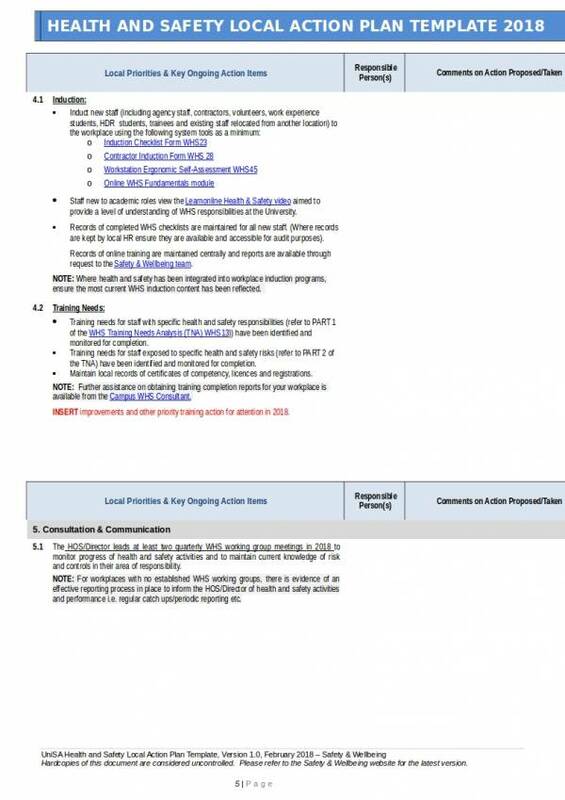 We hope that you learned something about health and safety plans as well as their templates. 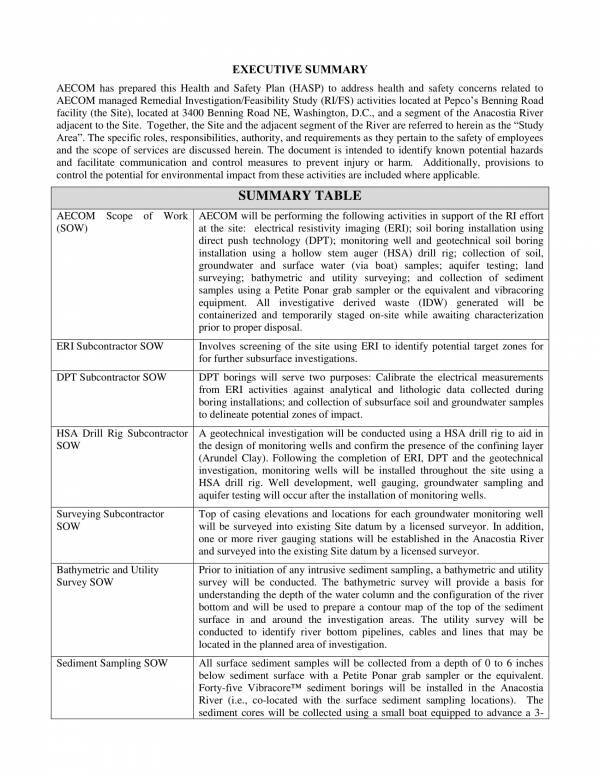 We also articles about related topics with useful samples and templates. Some examples that you may find on our website are Business Plans Samples, Sample Marketing Plans, and Simple Operational Planning Samples & Templates.